Erica Ueno combined Geographic Information Systems (GIS) and nutrition to map out food insecurity across Southern California's Inland Empire. Erica, a Nutrition MPH candidate in the coordinated program in dietetics at LLUSPH, worked with the Lewis-San Antonio Healthy Communities Institute for her 300-hour practicum experience. The mission of the Institute is to promote a healthy lifestyle and prevent the development of chronic diseases. 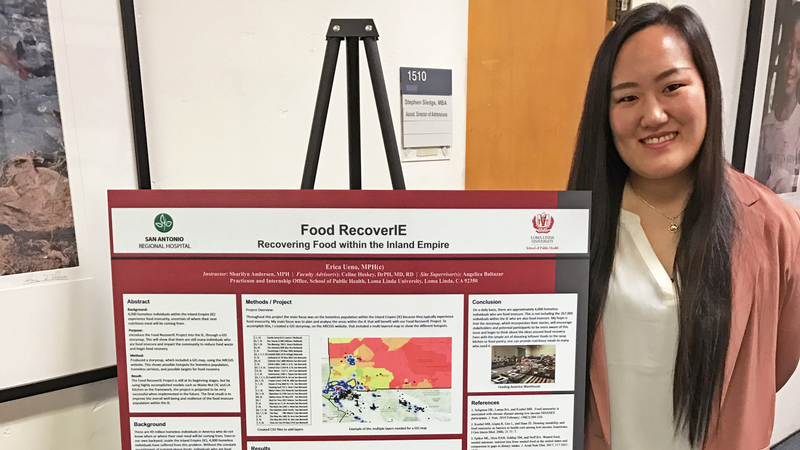 As part of her practicum project, Erica worked alongside employees of the Institute to develop a food recovery project for the Inland Empire called Food RecoverIE. According to Erica’s research, 49 million Americans are homeless and 4000 of those reside within the Inland Empire. Erica's project was formed to promote food recovery and decrease the number of individuals with food insecurity. A food insecurity is defined by the USDA as "reduced quality, variety, or desirability of diet...[and/or] multiple indications of disrupted eating patterns and reduced food intake." "Being food insecure doesn't necessarily mean you are homeless," says Erica. "Over two-hundred and sixty thousand individuals within the Inland Empire are food insecure." As part of the MPH curriculum at LLUSPH, Erica began her Nutrition program in the Public Health Core or PCOR. One of the topics Erica learned during her time in PCOR was GIS. She used the skills she learned during this course to create a map for her food recovery project. Using different data and hotspots, Erica showed homeless populations, homeless services (such as food banks and soup kitchens) and targets of possible food recovery locations (such as grocery stores and local businesses). When Erica showed her GIS story map Lewis-San Antonio Healthy Communities Institute, her preceptor shared it with ESRI, the largest GIS company in the world. The story map was posted on the ESRI_Health Twitter account as part of their #storymapmonday.